The equipment is indicated by the combination of a pulse oximeter and a separately usable (removable from the monitor) BIOSCOPE. Pulse oximeter and BIOSCOPE are united to a small compact monitor. The monitor could be used as a desktop model or fasten at an infusion stand by a tripod holder. 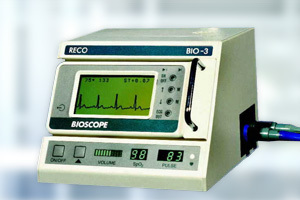 The anaesthesia monitor BIO-3 is for battery operation only and has a changeable accumulator. The operating time with a fully charged accumulator is about eight hours. The battery will be recharged outside the monitor in a special charger. So a recharged battery can always be held in stand-by. Matchless favourable price by integration of the emergency ECG unit BIOSCOPE-C which remains available outside the monitor as well. Important: No longer available! Service for BIO-3 is continued. Please note: The orig. battery is no longer available! An equivalent rechargeable battery (NiMh) is available. Please ask for information. ECG memory max. 11 min.